Annie Lennox and The Script were also celebrated at Saturday's star-studded ceremony. The winners of the SSE Scottish Music Awards have been announced at a star-studded ceremony in Glasgow. Snow Patrol, Susan Boyle and Tom Grennan were among the winners at the event on Saturday night. The awards, now in their 20th year, were held in partnership with the Nordoff Robbins music charity which provide music therapists to people with life-limiting illnesses or physical disabilities. Susan Boyle took home the highly coveted Scottish Music Hall of Fame Award, returning to the spot of her 2008 Britain's Got Talent audition to collect it. She said: "I'm thrilled to support Nordoff Robbins here tonight. "The charity holds a special place in my heart." Boyle told STV's entertainment reporter Laura Boyd that she will be releasing a new album early next year. Not wanting to give much away, the star quipped: "You'll have to buy the album to find out what it's like!". Annie Lennox was also inducted into the Hall of Fame. She was unable to attend the ceremony, instead sending in a video message to thank the organisers for her award. "I just wanted to say thank you so much for giving me this" she said in the clip. "I'm so proud of the work that Nordoff Robbins does and all I can say to you is thank you, thank you, thank you." 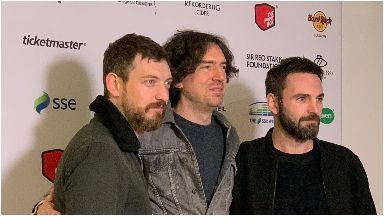 Snow Patrol took home the award for SSE Artist of the Year, whilst fellow rockers The Script were chosen as Best International Artist. Rising star Tom Grennan was crowned Best UK Artist.